As many of you know, my husband and I participate in a little food challenge with our friends in California. If you’re new to the blog, the challenges are loosely based on the show, Chopped. We blindly pick 4 ingredients – a protein, a starch, a vegetable, and a ‘miscellaneous item’ – and we then have to create an interesting and delicious meal which highlights these 4 mystery ingredients. Nich and I cook our challenge meal (here in Portland) and Taylor and Brittany cook their meal (in California). We then post our creations on the blog, and ask you to vote on which meal you think was best (For reference, please see Challenge #1, Challenge #2, Challenge #3, and Challenge #4) . Granted, we understand that you cannot taste the meal, so voting is difficult. But we don’t really care about having a winner or a loser, we are honestly just curious about your thoughts on our creations. Did we use the ingredients creatively and cohesively? Would you want to eat either meal? I can speak for all four of us when I say that we love doing these cooking challenges. The challenges push us to be better cooks, to think outside of the box, and to use ingredients in unique and exciting ways. Some of the best meals we have ever made are a result of these challenges. This meal was certainly no different. 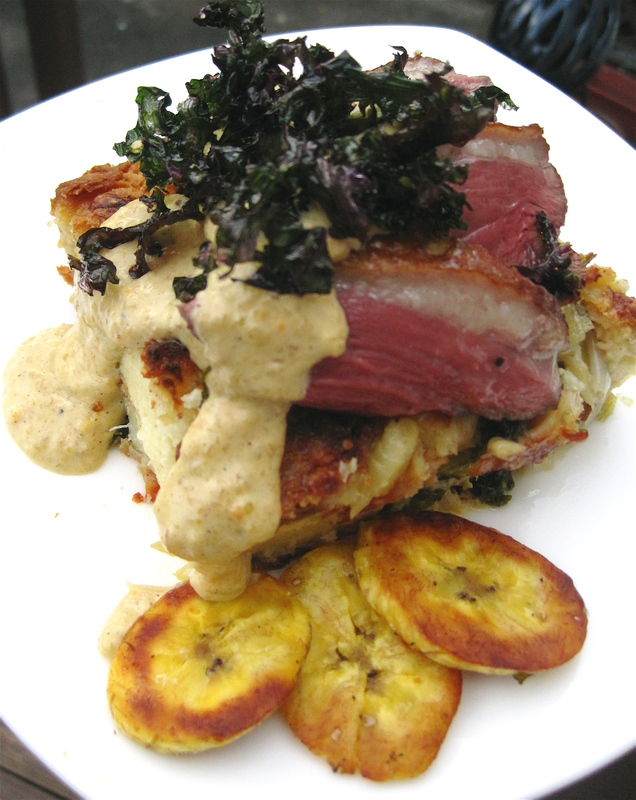 For the fifth installment of the LBC vs. PDX COOKOFF CHALLENGE we had to work with the following ingredients: Duck, Kale, Brioche, and Plantains. When I saw that we had drawn these ingredients, I was thrilled. There isn’t one bad thing in that bunch. In fact, Nich and I had a really hard time deciding what to make because the ingredients were too good; the options too limitless. Our brains went into overdrive, trying to figure out the best possible combination of these four ingredients. And, this is what we came up with. Cast Iron Grilled Duck Breast, served atop a Brioche Bread Pudding with Melted Leeks and Green Kale. Served with a Smoky Plantain Crema and Crispy Fried Kale Strips. 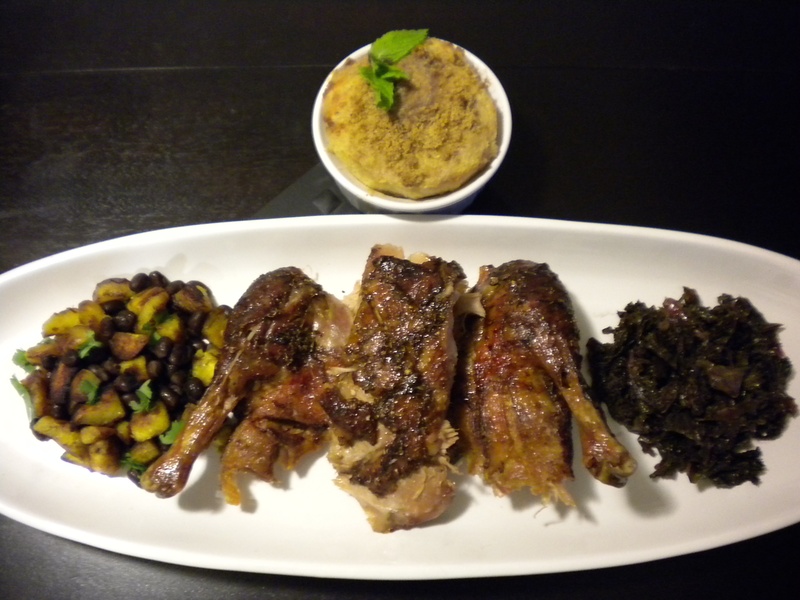 Whole Roast Duck (with a Hoisin Jerk Glaze), Plantains with Coffee Black Beans, Coconut Milk Kale, and a Rum Caramel Brioche Cake with Mint. So there you have it, folks. Here are the incredible meals we dreamed up for our four star ingredients. What do you think? Which meal do you want to eat? I feel like I would do some bad things to eat either of these meals… you guys are all friggin amazing! My vote if for Lindsay & Nich because you made one main dish that included everything and that’s just impressive.